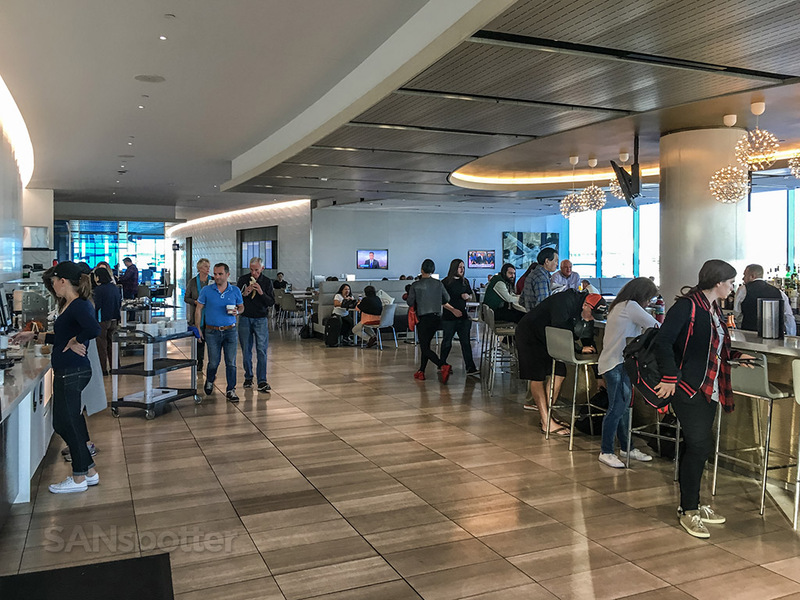 Let’s be honest here – United Clubs aren’t exactly known as the best places for stylish and swanky airport lounging, which is precisely why I wasn’t running in a mad sprint from the airplane to the entrance of this lounge here at terminal 7 right after arrival from San Diego. 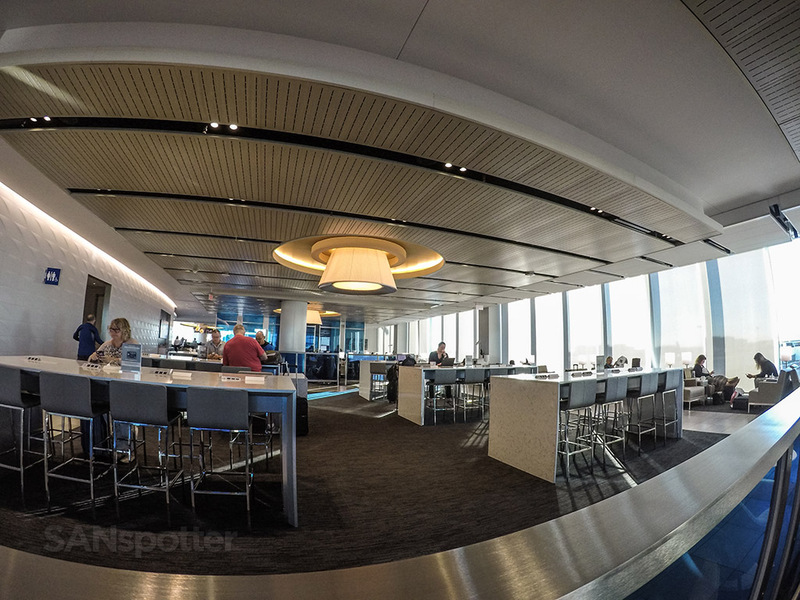 As matter fact, hanging out in the United Club was nowhere near the top of my priority list. The first thing I needed to do was establish where my connecting flight to EWR would depart from. Then I needed to hit the bathroom. If I had any homework or taxes to do, I definitely would have taken care of that. But I didn’t, so that left me with trying to shoot enough b-roll for the video that I was planning to create for the LAX-EWR segment. 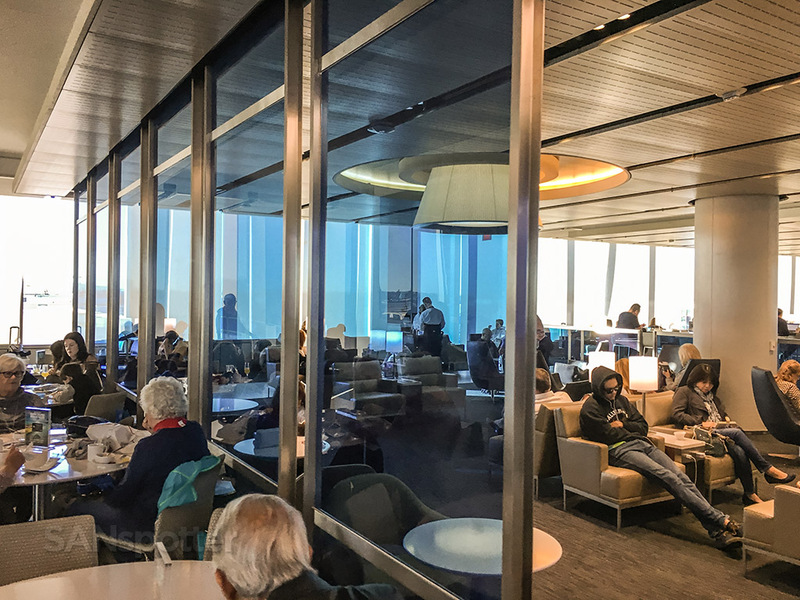 Only then, after all that, if I still had time…a quick visit to the United Club seemed like a decently ok way to kill some time. 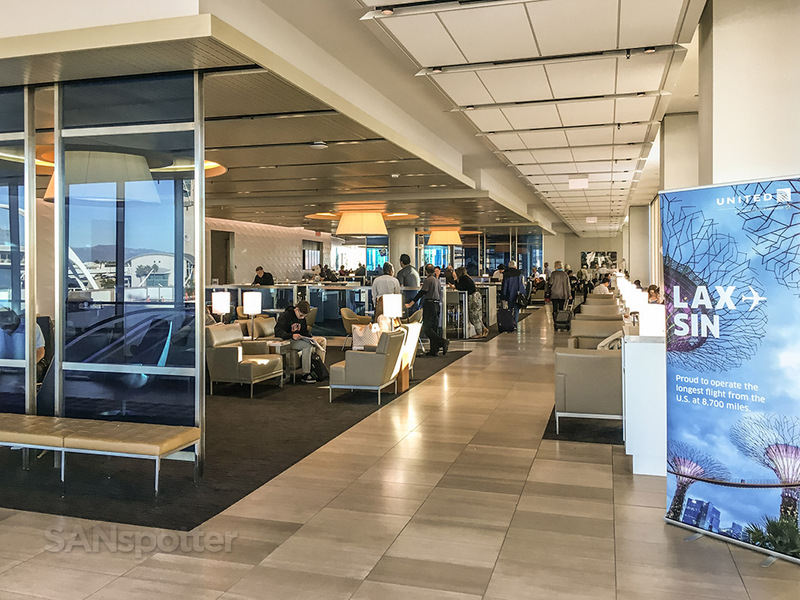 Thankfully, the busy innards of LAX make it easy to obtain nice b-roll (a timelapse of a crowded airport terminal is the cornerstone of any decent video trip report), and once I had enough footage I found myself standing right at the entrance of the United Club – completely by chance. Heck, I might not have even gone inside if it wasn’t so conveniently there right in front of me. 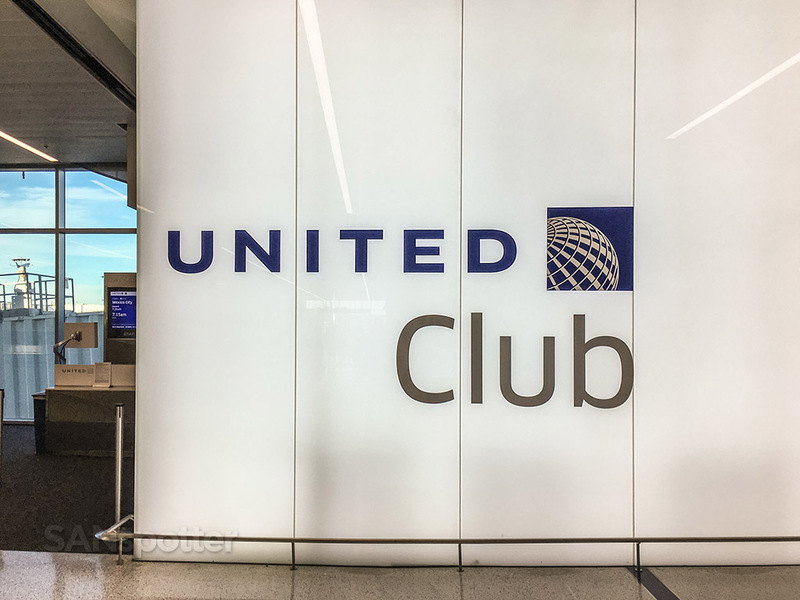 I mean, it would’ve felt totally awkward not to go inside, with that huge “United Club” signage hanging on the wall not two feet in front of my face. “Let’s do this…” I muttered to myself with a sigh, and walked through the automatic doors expecting nothing but stale mediocrity. Since it’s right here, I might as well. I still have time to make a run for it if I want. I haven’t fully committed myself yet! 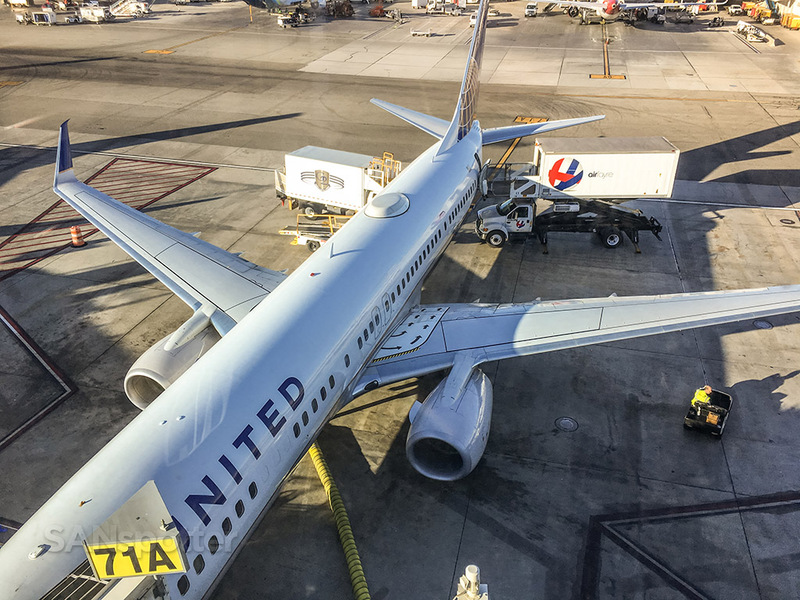 I’ve only been in three other United Clubs at this point in my travel career, and none of them other than the one at SAN has impressed me (I’m not linking to that review, because it’s old, outdated, and one of my worst!). 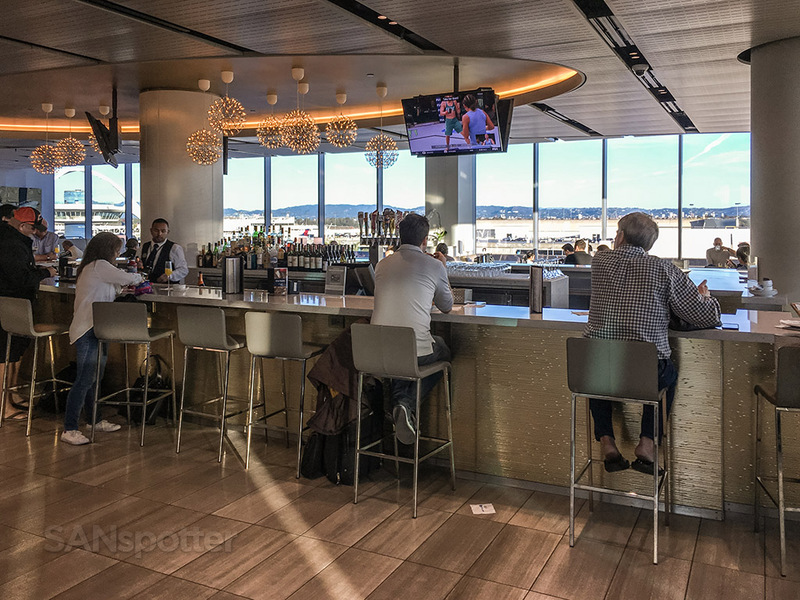 The new one up at SFO is nice (it’s the old Global First lounge), but it just feels too classy and not fitting of United brand at all. The one at O’Hare was nice, but it was so generic that I would never even remember what it looked like if it weren’t for my archive of pictures from that particular trip report. But this one here at LAX… Wow! It was big, bright, and not at all what I was expecting. 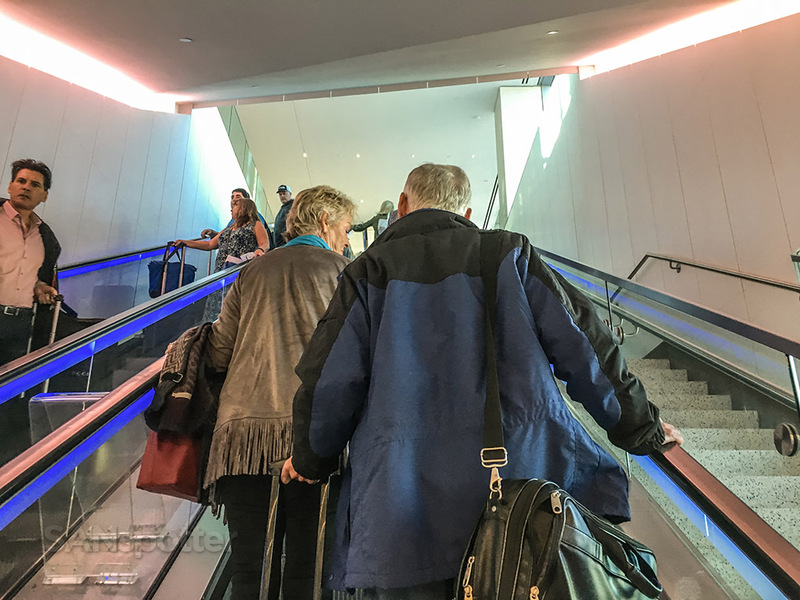 Like a moth to a flame, the first thing that this airliner nerd spotted upon reaching the top of the escalators was the awesome view to the outside. 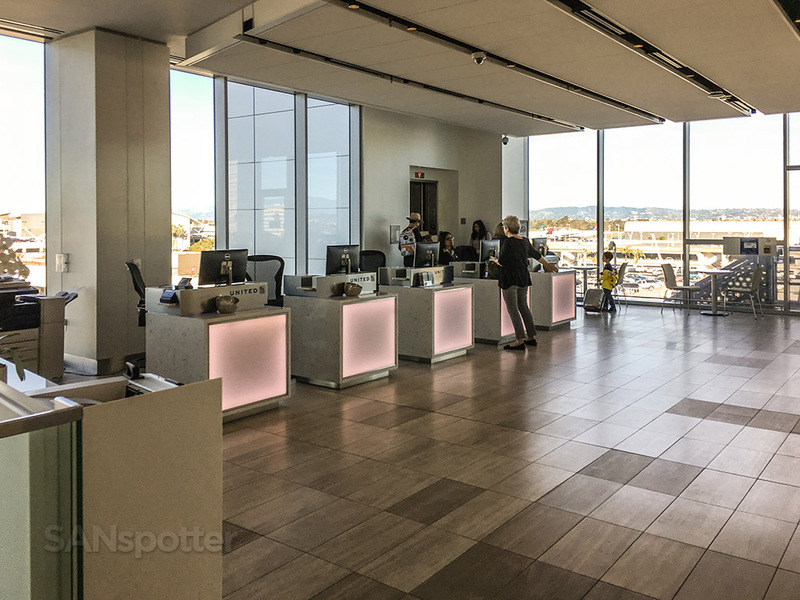 Once I peeled my eyes away from the window, I realized that this area was a secondary lobby with some customer service desks against the back wall. In the opposite direction was the main entrance. Like….whoa. It was sensory overload as soon as I walked in, but the thing that impressed me the most was the size. This is a huge lounge, and despite how crowded it was, there seemed to be plenty of seating for all and I had absolutely no problem jumping around from chair to chair trying to find one that I liked. I almost felt like Goldilocks as I sat down in chair number three and proclaimed it to be “juuuust right”. 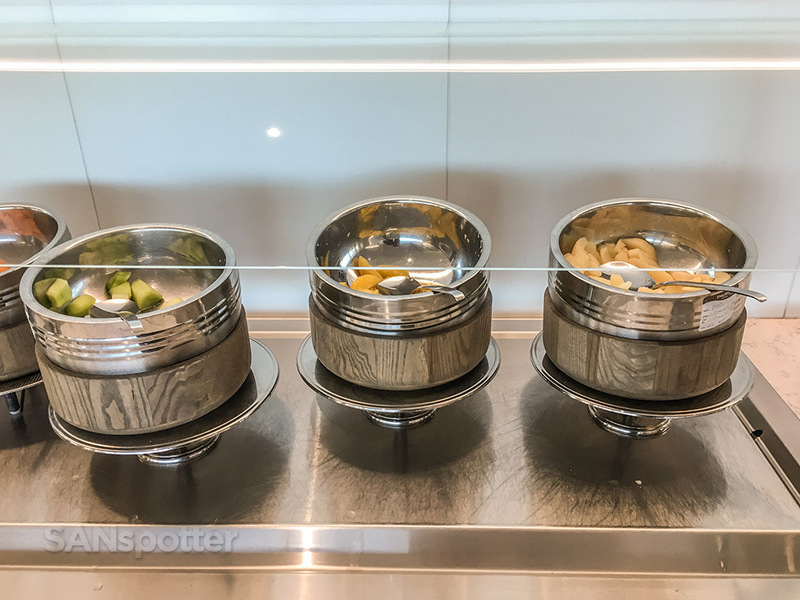 Everybody has their own preference when it comes to airport lounge seating, but I like a chair that has an even mix of squishiness and flatness so as to be able to set down a plate of food. Oh yeah, and a couple USB ports always come in handy. This is definitely not the stuffy lounge I was expecting. I’m not exactly sure what’s going on at United Airlines lately, but if this is a sign of things to come, I’m totally onboard. An entire wall of windows and high ceilings. Perfect. Transparent sound barriers are nice, especially so you don’t have to hear the guy on the other side describing his recent colonoscopy in horrific detail to his travel buddy. Thankfully it was pretty quiet in here despite being packed to the gills. 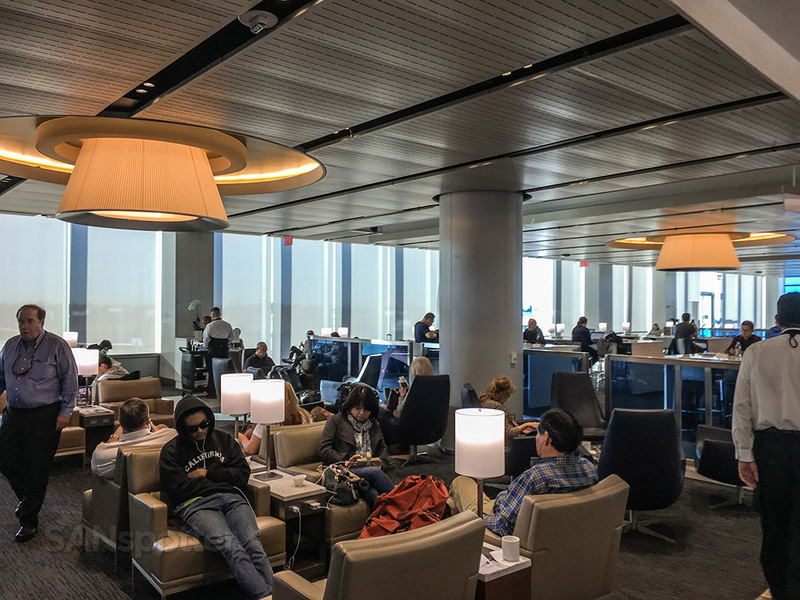 These communal workstations are a neat idea – but unfortunately, it didn’t seem that very many people were feeling very communal today. Maybe it was because of these very uncomfortable looking chairs. It doesn’t look so bad to me though, and if I had a lot of work to be doing, that’s exactly where I would be sitting. Here’s a wide angle view of the front room. As you can see, this place is huge! By the way, if anyone was wondering what Santa Claus was doing on the morning of November 23, he was apparently flying United Airlines out of LAX. Ha! But seriously, this guy must be a total hero to friends and family around the holidays. 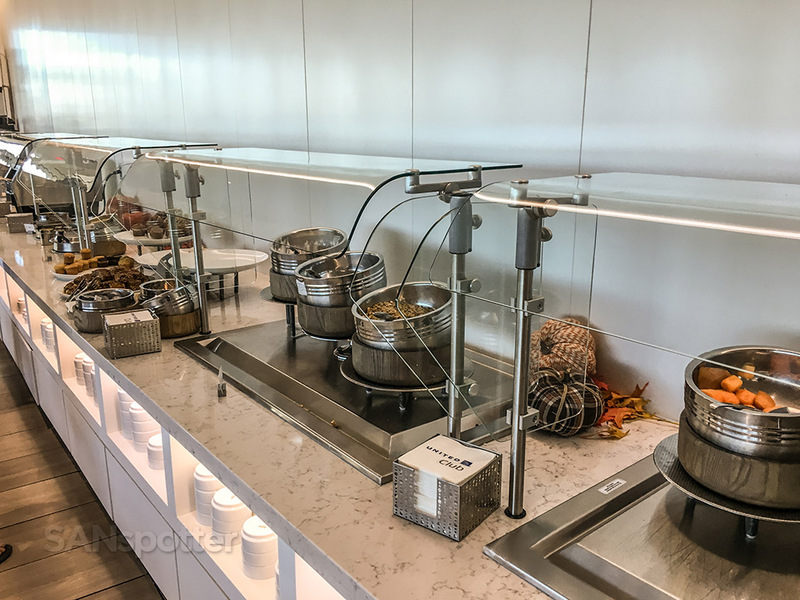 When it comes to food, there’s really not much to say about the offerings here in this particular United Club. 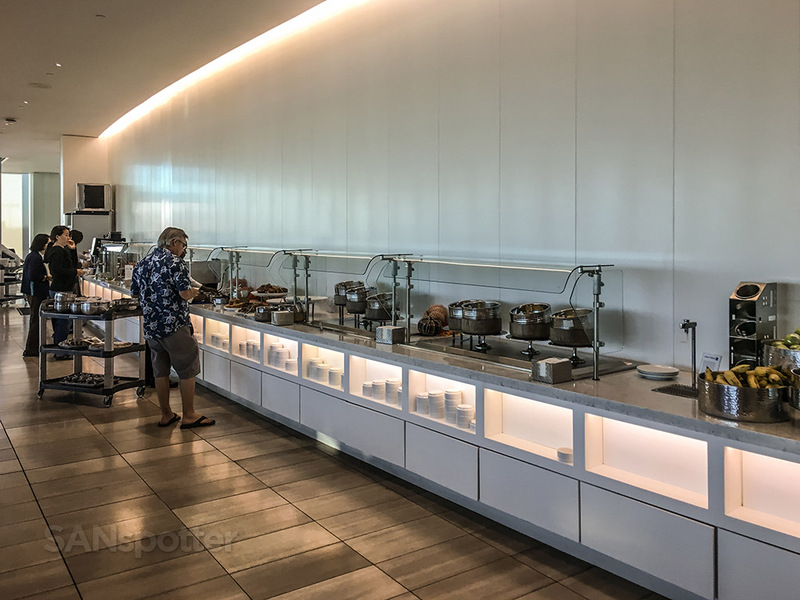 It was typical of any other airline lounge you might find in the US right now, meaning that most of the free food is of the “light” variety: cereal, hot oatmeal, some breads, and fresh fruit. Of course there are much more substantial options available (there are menus floating about everywhere), but substantial food comes at an additional cost. All of the complementary food items are placed along the back wall in the second room. Cereal, bread, and fruit. I wasn’t expecting Lobster Thermidor or anything, but why can’t more lounges in the US be like The Bridge? My snack this morning. Keeping things light, only because I know breakfast on the plane is going to be a bit on the heavy side. Travel blogging 101: never EVER start a meal without taking a selfie first. A liquid breakfast is also an option at the adjacent bar. The food is on the left, and the bar on the right. It was kind of funny to watch people walk past the food with a look of disappointment on their face and then proceed directly across the aisle to the bar. I spent nearly 45 minutes in here this morning, which was surprising to me considering my lack of enthusiasm for even being here in the first place. 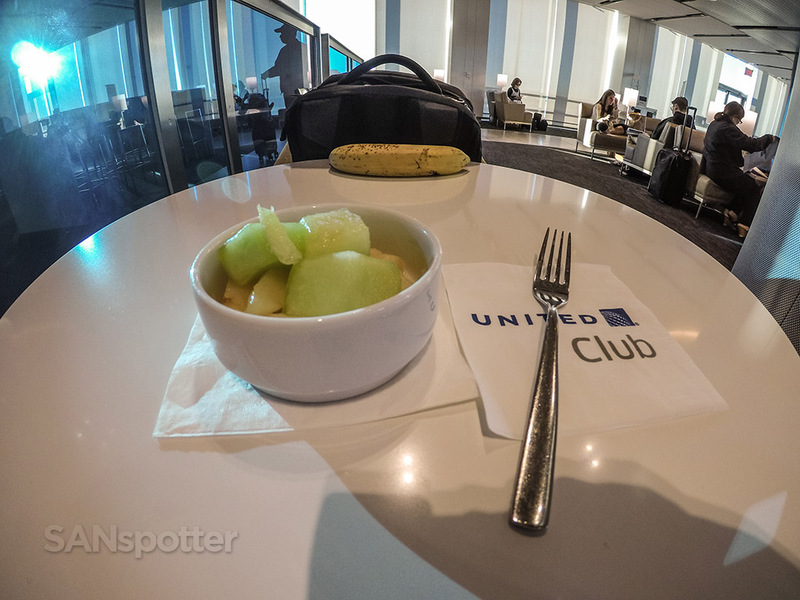 This is the first United Club that I’ve ever been in that felt completely “right” to me. 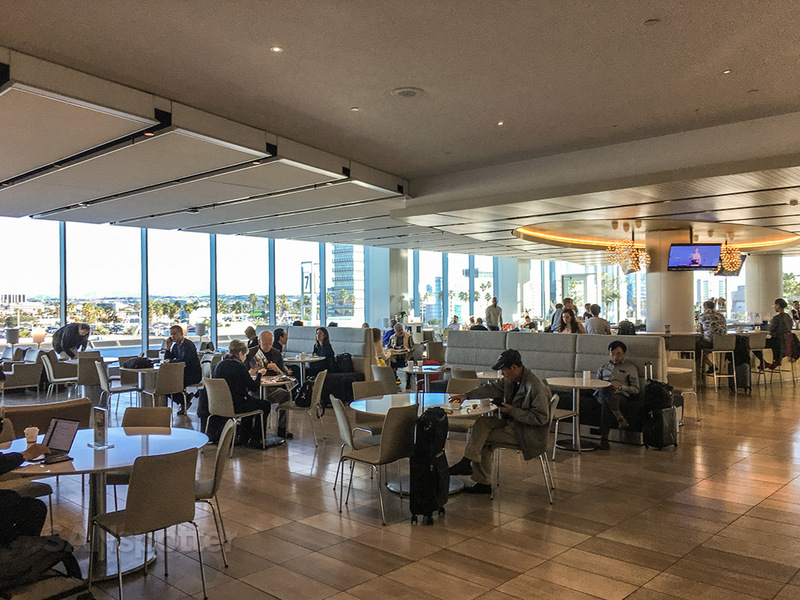 Of course the one at San Diego international Airport is nice, but it’s very small. 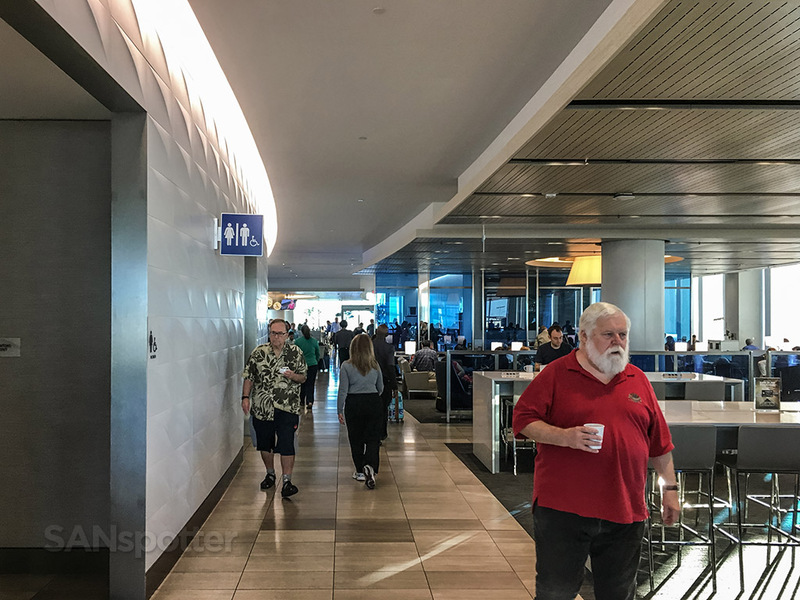 This one here at LAX has no size issues at all – it’s huge, end it didn’t seem to have any problems at all swallowing up fhe masses of travelers streaming through the main entrance on a steady basis. 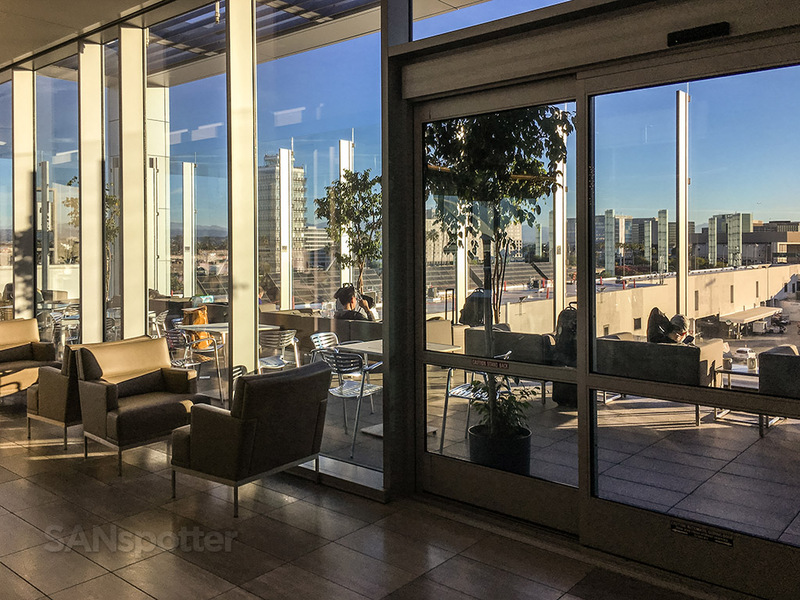 An added bonus of the United Club here at LAX is this very cool outdoor terrace. 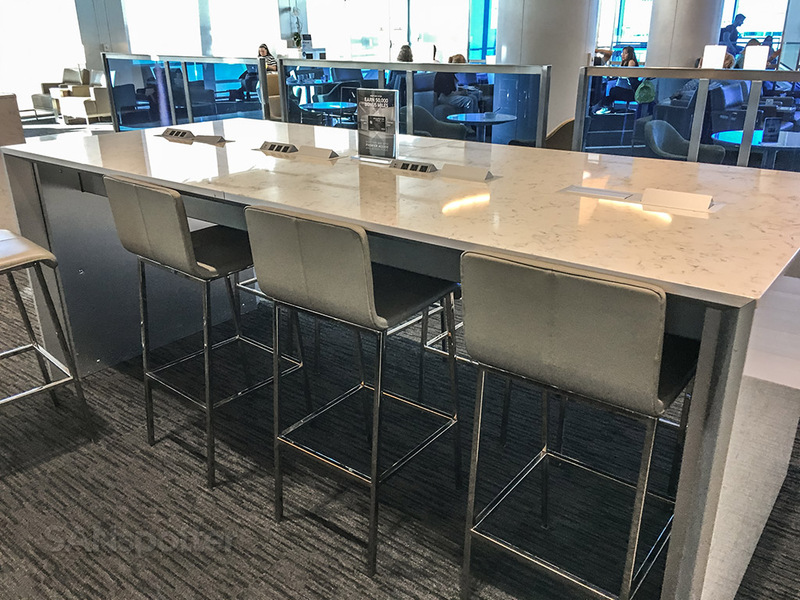 A necessity for all airport lounges here in Southern California! 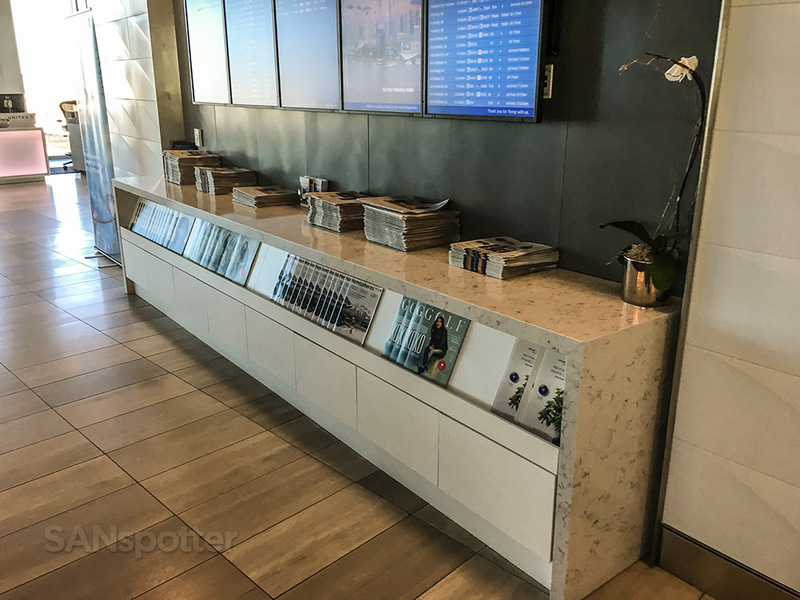 Oops – can’t forget a pic of the magazine and newspaper rack. 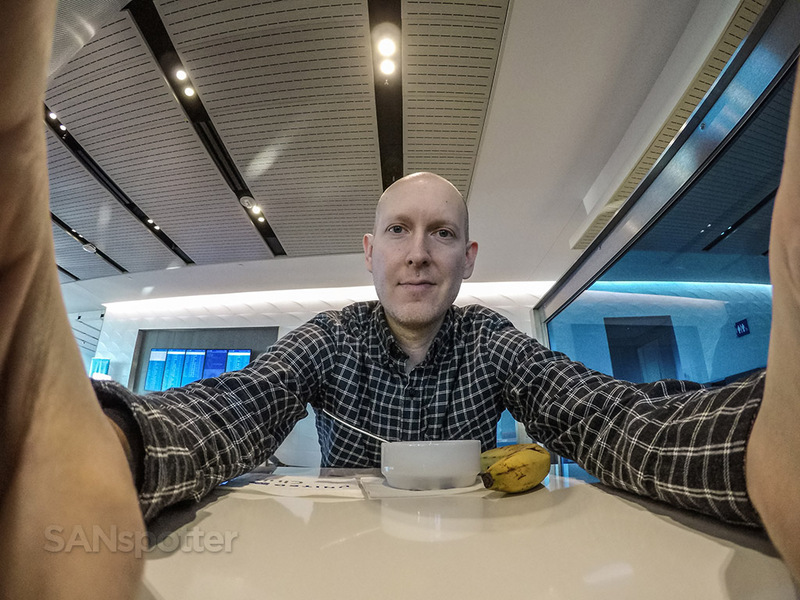 No decent airport lounge review would be complete without one. 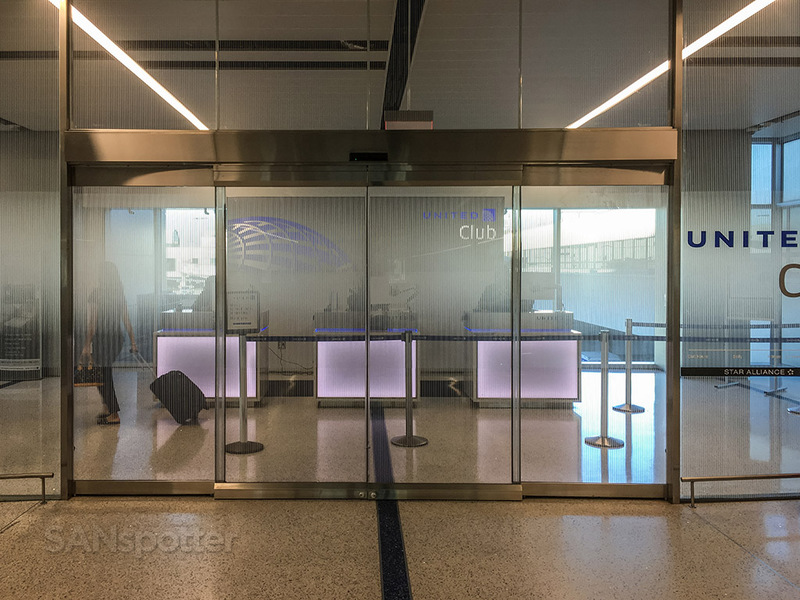 It’s surprising even to me that I would ever consider a United Club to be “very stylish”, but I guess they are really serious about their new Polaris branding thing they’ve got going on. There is plenty of natural light in here, with very attractive textures and materials glittering all that light in a nice but not-too-annoying way. 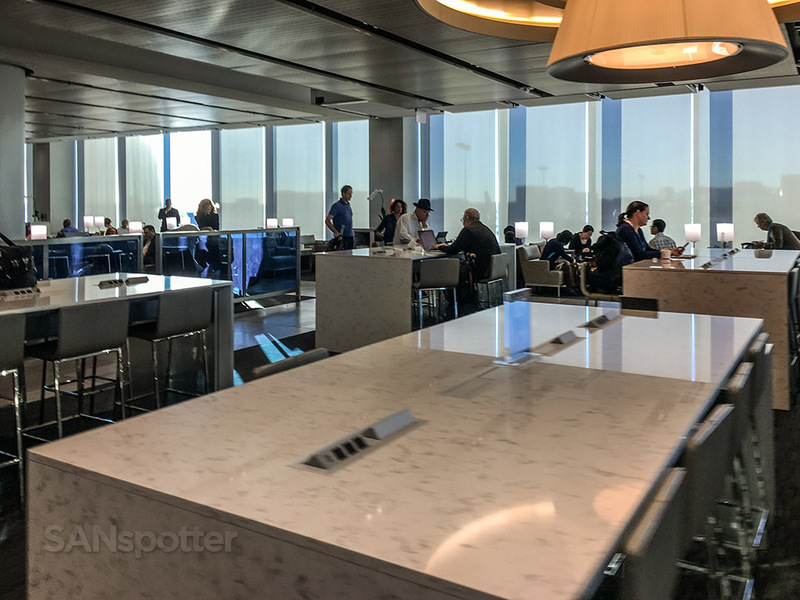 I’d even go as far as to say that this lounge changed my opinion of United Airlines as a whole and has set the bar for what I expect a domestic business class lounge to be. 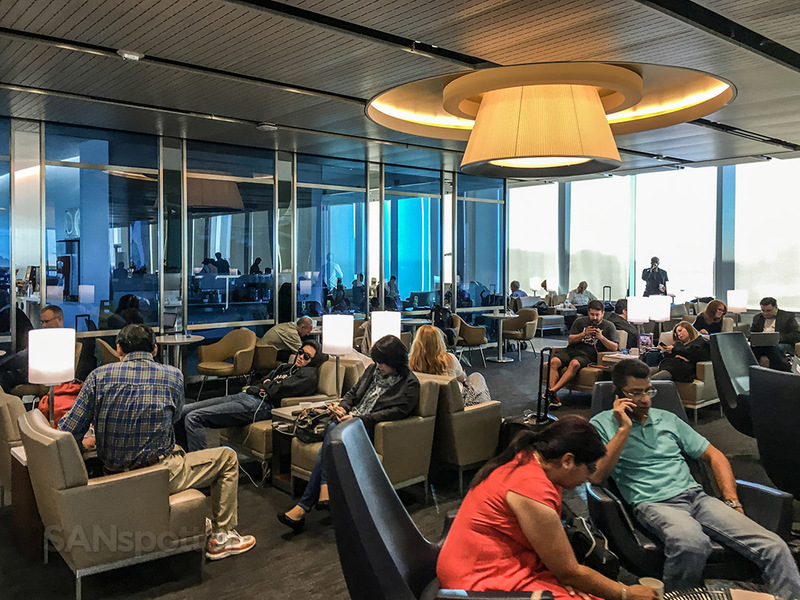 Don’t be like me and feel like it’s not worth visiting the United Club when passing through LAX. It’s totally worth it, and I’m definitely looking forward to my next visit.